Chapter 9 again deals with asymmetric capacitors, but considers the environment, thruster application, and configuration of the devices. Following in the footsteps of T.T. Brown, enthusiasts have been able to create levitating devices. But the question is how do these devices work? This chapter furthers attempts to answer that question. It states up front that current involves charged ions which experience multiple collisions with air, collision that transfer momentum. All measured data was found to be consistent with this model. This chapter investigates several alternative explanations (including a number of options not discussed in chapter 8), but dismisses them all. The first capacitor discussion focuses on geometry. There were four devices made, and their circuit diagrams are shown below. Devices 3 and 4 have greater asymmetry than devices 1 and 2, and consisted of a cylinder and disk. When all of these tests were made, the location of the ground was constant, as to have a test that was legitimate. Many other tests were made by others, but they rarely had a constant setup with the ground. The chapter emphasizes that different results in previous experiments were due to a problem pertaining to the location of the ground. Several devices use aluminum and have sharp edges. Sharp edges and high voltage create electric fields, which may help with exerting a force. A typical lifter is made of aluminum foil, and has the wire near the aluminum foil on the upper side (see Figure 1). The wire is a sharper surface than the Al foil, with wire charged different potentials. Likewise, disks were considered to be sharper objects than cylinders. 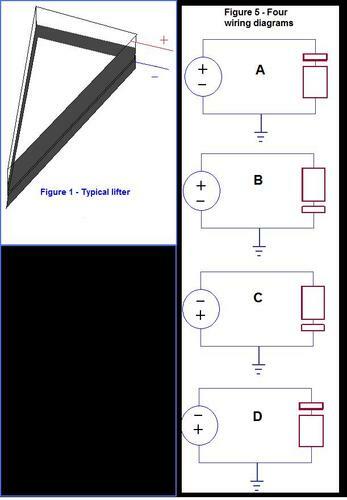 To summarize this test, devices 1 and 2 produced forces on the capacitor toward the non-grounded surface. Devices 3 and 4 (4 had wires pointing away from the disk) produced forces on the capacitor away from the cylinder, and toward the disk. Devices 1 and 2 created a larger force when the disk was the non-grounded surface. Polarity has virtually no effect on force. Whenever the cylinder was grounded, devices 3 and 4 were more powerful, but device 3 produced more force than 4. The current to the non-grounded portion of each device was stronger than the grounded side. People could witness the electric force on their hair. Note: the chapter had photos for devices 1, 2, and 3, but this chapter had a copyright so the photos will not be included here. There was some confusion as to whether circuits A, B, C, and D were equivalent with devices 1, 2, 3, and 4, but it eventually became clear that they were not synonymous. Tests to follow were atmospheric in nature, with different gasses and pressures used. For these tests, bursts of current (Trichel pulses) were observed in the non argon and nitrogen tests. Very high frequency (VHF) emissions of radiation were also observed in the non argon and nitrogen environments. The air became ionized when it was available. Radiation is just photons. When these hit an atom they can excite or liberate the electrons. For excitation, a specific energy (frequency) of the photon is required that varies with the atom. Devices 1 and 2 produced a force dependent on the location of the ground for this experiment. However, devices 3 and 4 made a force that was determined by asymmetry. When a complete vacuum was used, there was only a brief flash of light, and nothing more of interest. This can most likely be explained by residue water droplets that condensed on to the device. It is unlikely that mass was lost (ejected) from the machine over the course of the experiment. Image charges could have disrupted this experiment, but by pulling down toward the Earth rather than pushing away (as with antigravity) indicated that this was not what could explain lift. The effects in this experiment were most likely caused by ion drift. This is probably true because of the lag time for force. It took longer for ions to cross a gap, and thus longer for force to be generated. 77% of the force predicted was generated, which helps to prove this idea. To conclude on gasses and forces, the less atmospheric pressure, the weaker the force becomes.